Do Kenyan coffee farmers accept solar technology? A new study finds coffee cooperative members in Kenya positive about solar technology but wishing for more knowledge and reasonable installment solutions to make investments. We asked Sabina Oehme, who conducted the study together with Emma Levison, more about the results. The purpose of your study, Social acceptance of solar technology – A field study among coffee co-operatives’ in rural Kenya, was to investigate which aspects that affect coffee farmer’s social acceptance of solar technology. Why study this? –We know that the coffee industry is highly affected by climate change. We also know that the producers make small profits. By reducing their fuel costs and making a transition to renewable energy the farmers could possibly get a safer, more reliable and environmental friendly energy source than electricity, diesel and paraffin that they use today. So, solar technology can both benefit the farmers and the climate. One of the largest barriers for new technology is the social acceptance and that is why we wanted to focus on the factors that have an impact on the social acceptance of solar technology. You interviewed 72 farmers, all members of Kenyan coffee cooperatives working in partnership with We Effect. What was their perception of solar technology? –The farmers think the technology is quite easy to handle. Many have interacted with solar and have it at home. During the interviews the farmers often described solar technology as ‘user friendly’. Their perception is that it is safer and easier to handle than paraffin, electricity or diesel. They also believe that it is more reliable since it depends on sun and the sun is there. 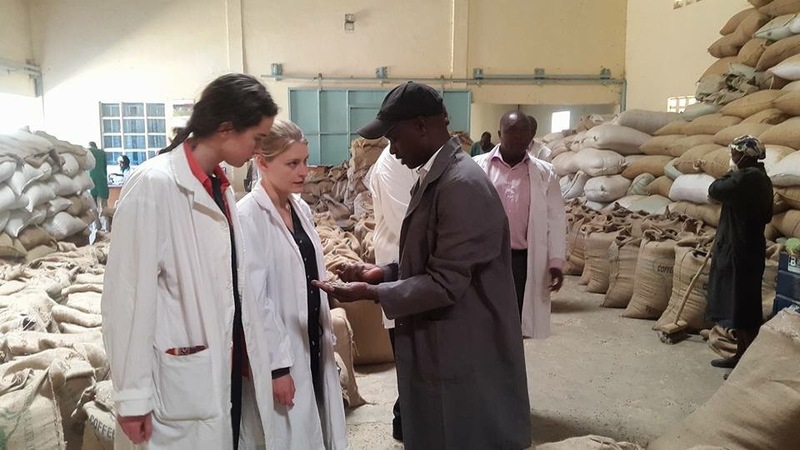 Students Sabina Oehme and Emma Levison at Kipkelion Union in Kenya doing research for thier study on coffee farmes social acceptance of solar technology. –The farmers are very positive in general and they can name the visible benefits and the most mentioned benefit it that there are no fuel costs. We found that their knowledge and access to information needs to increase. It is very important to show the farmers how the technology works and to make the benefits visible. ‘What you see is what you believe in’ is a phrase commonly used. They thought that demonstrations at the union level could be a good way to gain acceptance. Some farmers were skeptical because they thought the technology was too expensive and that it would be better to invest in electricity. So, what is the conclusion of the study? –The study shows that solar can’t replace the factories current energy solutions for processing and pulping. But it is a viable alternative at household level and a good supplement at the factories. With solar the farmers could run security lights at night to avoid theft and solar lamps could replace the paraffin lamps they use when they work late hours during the harvesting months. There exists a social acceptance of solar technology among the farmers but they don’t have the resources to make the investment due to high initial costs. What are the barriers for coffee farmers accepting and investing in solar technology? –The barriers are knowledge and finance. The unions and the cooperatives need more information and knowledge about the technology. Communication channels need to be set up between the unions and the solar technology providers. The farmers need to see and experiment with the technology and its benefits before accepting it. The initial cost is a big barrier and there is a need for down payment models that suit the farmers financial needs.